If you love all things vintage when it comes to fashion and love a thrifty find at the local car boot, then you’ll love this girl’s blog. Kavita, an 18 year old student from South Yorkshire, writes the lovely blog ‘I Heart Vintage‘, where she documents her latest car boot and charity shop finds, posts about her outfits and tells us what items she is lusting after in her ‘Wednesday Wishes’ posts. Kavita has challenged me to recreate one of her most recent looks from this post. I love this look, as she shows how to wear chinos a little differently to what we would expect. I would never of thought to pair them with a rock t shirt and leather biker jacket, but she pulls it off brilliantly. 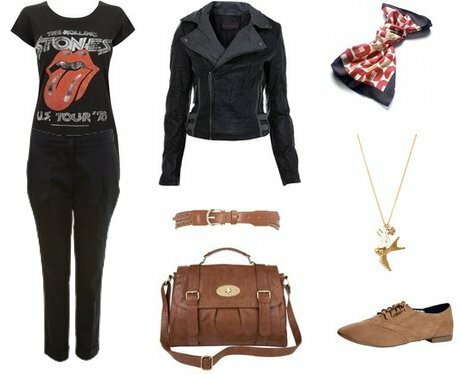 Kavita wears a vintage leather jacket, Â a rock t shirt and navy chinos by Topshop, a vintage belt, brogues by New Look, a swallow necklace from a jumble sale and ring by Matalan. To recreate Kavita’s look you will need a pair of navy chinos or peg leg trousers. Roll these up to just above the ankles, and wear them with a rock or band tshirt tucked in. Add on a tan coloured belt to define the waist, and slip on some lace up brogues in a similar shade. Wear a black biker jacket to toughen up the look, but add feminine touches such as a delicate necklace and a vintage headscarf. Finish off with an oversized Â slouchy satchel, and away you go! A great daytime look with a difference. For more looks like this and some great tips on shopping for vintage, be sure to take a look at Kavita’s blog ‘I Heart Vintage‘. Lady Gaga's Dress at the Music VMA 2011: Will She Wear a Bag of Bones?